Emblem of Saraya al-Tawheed. 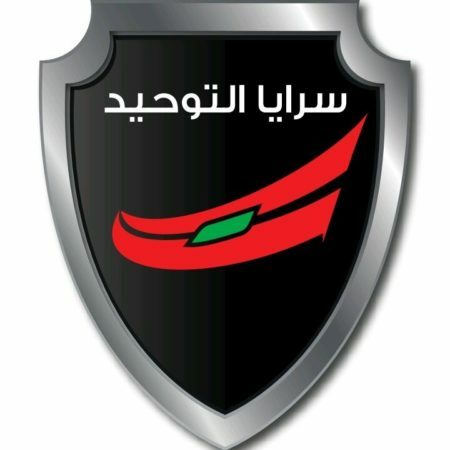 In the centre is the symbol of the Hizb al-Tawhid al-Arabi ("Arab Unity Party"), the political wing of Saraya al-Tawheed. The involvement of the Arab Unity Party- primarily supported by Lebanese Druze opposed to Walid Jumblatt- and its leader Wi'am Wahhab in the Syrian civil war has long been known, as Wahhab and his party have played a role in organizing forces in support of the Assad regime among Syrian Druze. 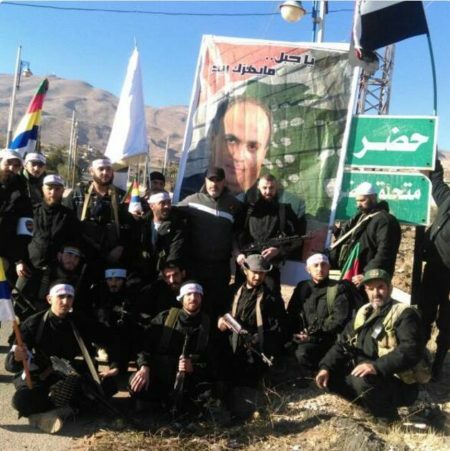 Indeed, the Arab Unity Party has openly identified a militia called the Ammar bin Yasir Battalion as its affiliate operating in Syria, claiming 'martyrs' on fighting fronts in both Suwayda' and Quneitra provinces as part of efforts to defend Druze areas. However, more recently another armed affiliate of the Arab Unity Party has come to attention: Saraya al-Tawheed ("The Unity Brigades"). The group received widespread coverage in the Arabic press for a parade and festival held in the Lebanese locality of al-Jahiliya (Wahhab's hometown) in late November 2016. According to the Lebanese newspaper al-Diyar (which is pro-Assad), the event was attended by a variety of notables from both Lebanon and Syria: "Representatives from diplomatic commissions, national parties, heads of municipalities and elective commissions in all the regions and villages of Chouf and Aley, as well as a number of the mashayakh [Druze sheikhs] in Hasbaya, Rashaya, Aley and Matn, along with mashayakh from Suwayda', Jabal al-Arab and Jabal al-Sheikh, and popular delegations from all regions of Chouf, Aley, Rashaya and Hasbaya." "Our honour will only be the honour of confronting the occupation and confronting the conspiracy, the Western-American project, the takfiri enemy and the Israeli enemy. Our honour is from Palestine and in Palestine, from Gaza and in Gaza, and in all the land of Palestine. Our honour is in Syria and in the face of the conspiracy against Syria, and our honour is in the resistance." For some context, takfiri refers to the one who declare others to be disbelievers, even when they profess to be Muslims. In the discourse of Hezbollah and the 'resistance' axis, the term is often used to refer to the wider Sunni insurgency in Syria, which, to be sure, harbours considerable anti-Shi'a sentiment to the point of pronouncing Shi'a to be non-Muslims. Qamiti also took the opportunity to emphasize the supposed role of the 'resistance' in protecting Lebanon, working alongside the Lebanese army and the security apparatus. Finally, Qamiti appealed to the Druze in the Golan as well as Jabal al-Arab and Jabal al-Sheikh, saying that they are "our brothers and allies in the resistance and working to the protect the Golan and Syria." For his own part, Wi'am Wahhab outlined the supposed role of Saraya al-Tawheed, clarifying that the group does not comprise "military or security brigades, or terrorist as the anxiously afraid say, but rather brigades of the coming change, the stormy change, the change towards a better tomorrow for us, our mountain and our people from Iqlim al-Kharoub to the last mountain and last patch of eart in Lebanon, from the south to the north: they are civilian brigades, rejecting the use of weapons except in self-defence and supporting the Lebanese army and the security forces if anything requires that, and confronting any 'Israeli' aggression. They are part of the resistance." Wahhab also highlighted his solidarity with the Assad regime, the Syrian army, "the Lebanese resistance" that has stood by Assad, and the Druze communities in Syria that have fended off rebel assaults (e.g. Hadr in Quneitra). Wahhab further took the opportunity to address his rival Walid Jumblatt, calling on him and others to come together "in solidarity under the banner of the mashaykh and not under the banner of anyone else." Here, it is worth noting two points with regards to Saraya al-Tawheed. First, the group did not suddenly come into existence last month. Rather, the groundwork was being laid for months prior to the parade and event in al-Jahiliya. According to the official for the Saraya al-Tawheed Facebook page who spoke with me, Saraya al-Tawheed was established six months ago. Indeed, in October 2016 the group was discussed in an article in the Lebanese newspaper al-Nahar, in which the Arab Unity Party's media director Hisham al-Awar made clear that the outlining of the framework and aims had already begun some time ago and that there were plans to hold a Saraya al-Tawheed parade on 20 November (as reported above) as part of "a celebration of solidarity with our Arab people in the occupied Golan, Jabal al-Sheikh and Jabal al-Arab"- all areas inhabited by Syrian Druze. In the same discussion with al-Nahar, al-Awar claimed that Saraya al-Tawheed already had "hundreds of members" not limited to Druze areas only, and that there were young women in the group as well. According to al-Awar, the notion of women being encouraged to join Saraya al-Tawheed was partly based on what Wahhab saw on his last visit to Hadr, in that a group of young women were apparently fighting in the area (cf. Labawat al-Jabal in Suwayda'). On the subject of whether there were links with Hezbollah's Saraya al-Muqawama ("The Resistance Brigades") that recruits non-Shi'a, al-Awar said that while the aims of Saraya al-Tawheed and Saraya al-Muqawama may overlap in many respects, Saraya al-Tawheed is "independent with its own framework, assignments, responsibilities and administrative organization." The second important point to make is that Saraya al-Tawheed's scope is not limited to Lebanon, even as the Arab Unity Party's messaging at the present time has largely focused on the idea of Saraya al-Tawheed as a youth group and support force for the Lebanese army and security forces to defend against attacks on Lebanon. The same official for the Saraya al-Tawheed Facebook page affirmed to me that "Saraya al-Tawheed in Syria is defending the land and honour in the localities and villages, particularly in Hadr and Suwayda'." The members of Saraya al-Tawheed in Syria, according to this source, are "of Syrian origin." A photo circulated on 24 November appears to show members of Saraya al-Tawheed in the Hadr area, put out with a caption on a Wi'am Wahhab Facebook page: "Tribute to Saraya al-Tawheed in Hadr who have prevented the terrorists from entering the locality with the participation of the rest of their brothers, mashaykh and people." Photo said to be of Saraya al-Tawheed members in the Hadr area. Note that the men are posing in front of a poster of Wi'am Wahhab. It may then be asked what the difference is between Saraya al-Tawheed and the Ammar bin Yasir Battalion. Well, not much, really. As per the official for the Saraya al-Tawheed Facebook page, the Ammar bin Yasir Battalion has supposedly been around since "the July war until today," whereas Saraya al-Tawheed is a newer formation, even as both groups are "two faces of one coin." The July war, known in Arabic as Harb Tamuz, refers to the conflict between Israel and Lebanon that began in July 2006 after Hezbollah attacked a group of Israeli soldiers. These events took place soon after the initial foundations of the Arab Unity Party in late May 2006. It should be noted that there appears to be no public information attesting to the existence of the Ammar bin Yasir Battalion as far back as 2006, though that does not necessarily mean it did not exist at that point. For comparison, the Iraqi militia and political faction Saraya al-Khorasani only really came to public light at first in 2013 with its involvement in the Syrian civil war but in reality, as subsequent information that has come to light has shown, it has roots going back much further to the 1980s and 1990s. Another case for comparison might be the Syrian Hezbollah faction called the National Ideological Resistance, which, as its leader claimed to me in an interview in 2014, has roots going back to mid-2009. Of course, there could be a degree of rhetorical exaggeration here, but one must not automatically assume that a movement comes into being simply when it begins announcing its existence on contemporary social media. The most likely motivation for the establishment of Saraya al-Tawheed is that it ostensibly represents more than just a mere militia amid a Lebanese political climate that may be wary of new militias that simply display shows of armed force. In contrast, the Ammar bin Yasir Battalion is something that has been very low-key apart from the claiming of 'martyrs' in Syria and cannot necessarily be presented as something beyond an armed group/militia. Wahhab also presents Saraya al-Tawheed as embodying something analogous to sports associations, while emphasizing a defensive function in support of the Lebanese state and within the framework of the law. Accordingly, Saraya al-Tawheed can perhaps be seen as more useful than the Ammar bin Yasir Battalion in terms of being a means of asserting greater political influence in Syria and Lebanon, by functioning as both a militia force and a form of wider social outreach. To conclude, an analogue here might be the Lebanese branch of the Syrian Social Nationalist Party (SSNP), which has a militia in the form of Nusur al-Zawba'a that has been fighting in support of the Assad regime in Syria and presenting itself as defending Lebanon, while engaging in wider social outreach in its zones of influence and control. The Lebanese SSNP has been able to extend its influence deep into regime-held Syria in particular, especially among the Christian populations in Homs and Hama. Perhaps the Arab Unity Party could achieve something similar with the Druze populations in Syria through the Saraya al-Tawheed project.